Chief of Staff to the President, Abba Kyari(left); NLC President, Ayuba Wabba and First Deputy President Trade Union Congress, Augustine Etafo after a meeting of labour leaders with Kyari over the ongoing warning strike on minimum wage at the Presidential Villa in Abuja. 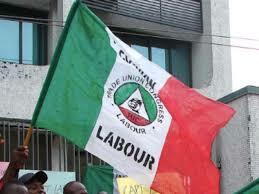 There are strong indications that the labour movement and its allies will suspend the on-going strike action tomorrow. The Guardian exclusively gathered in Abuja yesterday that this follows an assurance by the Chief of Staff to the President, Abba Kyari of direct intervention of President Muhammadu Buhari upon his return from the just-ended 73rdsession of the United Nations General Assembly (UNGA73). It was gathered that the Chief of Staff requested the delegation of the labour movement led by the President of the Nigeria Labour Congress (NLC), Ayuba Wabba to furnish him with the details of how the negotiation snowballed into a nationwide strike. After listening to the submission of labour, the Chief of Staff reportedly assured the labour movement that the President would prioritise the issue towards early resolution and requested the movement to suspend the strike. In his response, Wabba said they could not unilaterally declared the strike suspended, but have to report the outcome of the discussion to relevant organs before a final decision is made. To this end, the NLC and Trade Union Congress (TUC) and other allies are expected to meet in Abuja tomorrow (Sunday) where the strike would likely be pronounced suspended. A source privy to the negotiations said: “The organised labour has the assurance of the Chief of Staff that Mr. President would prioritise the matter as soon as he comes back from his trip to the United States. Meanwhile, more trade unions are declaring their support for the strike action. The latest are the Non-Academic Staff of Universities and Associated Institutions (NASU) and Medical and Health Workers Union of Nigeria (MHWUN). The General Secretary of NASU, Peters Adeyemi, who handed down the directive during the National Executive Council (NEC) of the union in Abuja yesterday berated the Federal Government for not providing the figures needed by the tripartite committee on minimum wage negotiation to conclude its work. Also, the President of Medical and Health Workers Union of Nigeria (MHWUN), Biobelemoye Josiah said all the members of the union have been directed to comply with the strike action until contrary directive is issued by the NLC. Adeyemi, who is also the Deputy General Secretary of NLC, said all its members have been directed to withdraw their services immediately until the action is suspended by the NLC. He made reference to the clause in the National Minimum Wage Act of 2004, which stipulates that minimum wage should be reviewed after every five years. According to him, the last review in 2011 was done after seven years, while the new review ought to have happened since 2016. Josiah accused government of not being sensitive to the plight of workers as soon as the price of crude oil improved in the international market. We were however shocked to learn that the government had decided to adjourn the meeting of the committee indefinitely with a purported intention to enable consultations. The MHWUN boss argued that with the price of petrol increased from N87 per litre to N145 per litre, devaluation of the Naira, increment of electricity tariffs, punitive exchange rate and hyper inflation have all connived to increase the pressure on the earnings of Nigerian workers.